San Diego is Southern California's southernmost city, located along the coast just north of the Mexican border and along the Pacific coast. Weatherwise, it's one of the most perfect climates in the world, with few really hot or cold days, plenty of sunshine and the occasional rainshower to keep things green. Downtown - located near the ocean, also includes the Embarcadero and the Gaslamp Quarter. A hub of business and nightlife on the bay, downtown has many tourist attractions among its gleaming office and hotel towers. Balboa Park-Hillcrest - Balboa is a massive urban parkland in the city's heart, home to many museums and the renowned San Diego Zoo. Next door is Hillcrest, a trendy urban neighborhood. Old Town-Mission Valley - The site of the first Spanish settlement in California, Old Town is a historic district popular with tourists. It sits at the foot of Mission Valley, a major commercial center. Point Loma-Ocean Beach - A scenic peninsula curving around the bay, this area offers gorgeous views of San Diego, beautiful coastline, and quiet, laid-back beach neighborhoods. Mission Beach-Pacific Beach - Two popular beach communities with plenty of shops, restaurants, and nightlife, alongside a manmade inlet that is home to Sea World. La Jolla - The charming seaside town of La Jolla has lots to offer. The town is expensive and filled with stunning mansions. Shopping malls and dining restaurants are situated along Prospect Street. Stroll along Coast Boulevard for the most scenic views and stop at La Jolla Cove to look at the colony of seals that has made it their home. Mid-City - A set of neighborhoods in the heights east of Balboa Park. There isn't much in the way of tourist attractions out here, but one can find trendy districts with locally oriented restaurants, shops, and theaters. North - A large region of the city composed of many suburban neighborhoods stretching far inland to the hills of the north, with a few scattered tourist attractions, including the popular Safari Park. San Ysidro - Home to the world's busiest land border crossing, where one can travel between San Diego and Tijuana, Mexico. This section is not contiguous with the rest of San Diego; you have to travel through the suburbs of National City and Chula Vista on the I-5 or I-805 freeways or take the San Diego Trolley. Coronado - Though technically a separate city from San Diego, picturesque Coronado is closely tied to the larger city, sitting directly across the bay from Downtown with a splendid beach and the famous Hotel del Coronado. Balboa Park - Balboa Park is America’s largest urban cultural park. It contains a large number of museums, performing arts venues, gardens and horticultural institutions and attractions (including the famous San Diego Zoo). There's something for everyone at Balboa Park. Some highlights in the park include Mingei International Museum, Reuben H Fleet Science Center, San Diego Natural History Museum, The Old Globe Theater, San Diego Zoo, United Nations Building, Japanese Friendship Garden and Botanical Building with Lily Pond. 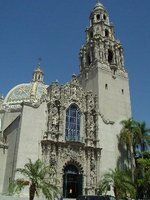 There is so much to see and do here that you could easily spend your entire visit to the city just at Balboa Park. Address: 1549 El Prado, Phone: (619) 239-0512, Hours: Grounds are open 24 hours a day. Individual attractions have their own operating hours. San Diego Zoo - The world-famous San Diego Zoo is divided into two parks; one located in Balboa Park is a traditional Zoo, and the other is a Wild Animal Park located north of the city. Expect to spend a full day exploring the zoo. The entire San Diego zoo accommodates more than 4,000 creatures ranging from giant pandas, kangaroos, and gorillas all housed in natural environments. Address: 2920 Zoo Drive, Phone: (619) 231-1515, Hours: Open from 9am, every day of the year. Closing hours vary between 5pm and 9pm depending on the time of the year., Price: Adults: $42. Children: $32 (aged 3-11). Cabrillo National Monument - The Cabrillo National Monument commemorates the landing of Juan Rodríguez Cabrillo at San Diego Bay on 28 September 1542 - the first time that a European expedition had set foot on what is currently the west coast of the United States. 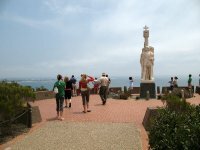 Located at a park at the southern tip of the Point Loma Peninsula in San Diego, California, the monument is a 14-foot-tall sandstone sculpture of Cabrillo donated by the Portuguese Government in 1939. There is a very nice view of the city from the monument. The park also includes a museum, an old defunct lighthouse, a new lighthouse and various former military installations. There are also some beautiful cliffs just down the hill from the monument and fun rock pools for kids to explore. Every year, various events are held at the monument. They include the annual Cabrillo Festival Open House; Kumeyaay, Portuguese and Mexican singing and dancing events; a historical reenactment of a 16th century encampment; and children's activities. Address: Catalina Boulevard, Point Loma Peninsula, Hours: 9:00am to 5:00pm daily (entrance closes at 4:30pm.) Closed on Christmas., Price: $5 per vehicle. Walk-ins, cyclists and motorcyclists pay $3 per person. Sea World is home to the famous killer whale named Shamu and several other stunning marine animals. Watch the acrobatic skills of Shamu and her buddies. There are various exciting and spine-tingling rides too like Journey to Atlantis, Shipwreck Rapids, and many more. Located at 500 Sea World Drive. Phone: (619) 226-3900. If you are a history lover then head to Old Town. This is considered the birthplace of California and was the site of the state's first permanent Spanish settlement. It is now home to a selection of historic buildings and a lot of Mexican restaurants and shops. It may feel a little gimmicky at times, but it is a fun outing and an enjoyable part of the city. Great place to have some lunch while enjoying the mariachi players strumming the sounds of Mexican music. Belmont Park - Check out Belmont Park, an amusement park at the Mission Beach boardwalk. It features two major landmarks: the Plunge and the Giant Dipper. Birch Aquarium at Scripps - Attached to the highly respected Scripps Institution of Oceanography, this aquarium has an abundance of great sealife to admire. Exhibits include the Hall of Fishes, Shark Reef, a 70,000 gallon kelp forest tank, Tide Pool Plaza and more. Over 380 species can be seen at the aquarium. Address: 2300 Expedition Way, La Jolla, Phone: (858) 534-3474, Hours: 9am - 5pm daily, Price: Adult: $14. Child (3-17): $9.50. Under 3: Free. Roam around the Embarcadero, home to watercrafts, aircraft carrier, Seaport village, and a maritime-themed shopping area. Enjoy San Diego nightlife at The Gaslamp Quarter. It is lively and always buzzing. Enjoy live music after dinner at restaurants which are mainly housed within restored Victorian commercial buildings. Cinco de Mayo (05 May 2014) - A celebration of Mexican heritage. There are lots of activities across the city, but the epicentre is in old town where a fiesta takes place over several days. San Diego must have some of the world's most perfect climates. It rarely gets really hot or cold here. Average daytime temperatures vary from 19 °C during the December to March period to 25 °C in August and September. Nights vary between 10 °C and 19/20 °C respectively. The summer from May to September is dry and just a few days see rain at all. Average rainfall throughout the year is just around 275 mm (11 inches). Most of the rain falls from November to April with around 5-10 days of rain a month and precipitation averaging around 30 mm a month in November and December to around 60 mm from January to March, which are by far the wettest months, accounting for around two thirds of the annual amount. San Diego International Airport (SAN) is just about 5 kilometres from downtown San Diego. Around 20 airlines serve San Diego, with the main destinations being Mexico City, Calgary, Toronto, Vancouver, Portland, Atlanta, Seattle, Chicago, Dallas, New York, Los Angeles, Cleveland, Houston, Detroit, Honolulu, Memphis, Minneapolis-Saint Paul, Salt Lake City, Denver, Maui, Boston, Albuquerque, Austin, Boston, Baltimore, El Paso, Kansas City, Las Vegas, Nashville, Oakland, Phoenix, San Antonio, San Francisco, St. Louis, Tucson, Washington, D.C., Charlotte and Philadelphia. It's the second largest single-runway airport in the world, after London Gatwick Airport and is the largest metropolitan area in the USA without an airport being a hub or secondary hub for any airline. If you are planning on flying to destinations in Mexico, it might be a good idea to check the Tijuana article. The Pacific Surfliner operated by Amtrak travels between San Diego and Paso Robles stopping en route in places like Los Angeles, Santa Barbara and San Luis Obispo. Trains are reasonably frequent, running every two hours or so and very comfortable. Just north of San Diego, the tracks travel right alongside the ocean providing really great views. If you are coming from Los Angeles Airport, you can catch a Flyaway shuttle bus to Union Station (roughly 40 minutes, $7 one way). From there you can take Amtrak to San Diego. 3 main Interstates start in or near San Diego. The I-5 runs north through California and Oregon and Washington, the I-8 runs east towards Arizona and the I-15 goes northeast towards Nevada. Greyhound has buses to other places in California. LuxBus serves Anaheim, Los Angeles and Las Vegas. Check the Port of San Diego for options of organized trips or cruises. There is no regular passenger service. Although San Diego is not a difficult city to get around by car, the traffic can be slow going during rush hours and parking can be expensive as well. The Metropolitan Transit System provides buses in the wider metropolitan area of San Diego County. It also operates the San Diego Trolley which is of importance for both travellers as well as people commuting between Downtown and the eastern and southern suburbs. Standard one-way fares run from $1.25 to $3 depending on how far you go, and if you are planning to use them quite a few times, there are also publci transport passes (which include bus service) starting at $5. There is the choice between 2, 3 and 4-day passes, which give you unlimited excess on the metro and bus. The Blue Line travels from the US-Mexico border at San Ysidro and runs to Old Town, via Chula Vista, National City, and Downtown. The Orange Line connects El Cajon and La Mesa cities with Downtown San Diego. There are also boats travelling between various parts within San Diego. The most useful connection is between downtown San Diego or the Embarcadero and Coronado. For a US city, San Diego is surprisingly walkable, and if you don't mind a bit of walking even the old town and the San Diego Zoo are within reach. At least it saves the hassle of finding out about public transport or car issues like parking. No matter what, downtown (including the Gaslamp Quarter) and the Embarcadero are easy for walking and you can walk from north to south or east to west within 10-15 minutes. Northeast from downtown, the Balboa Park connects the city to the zoo and botanical gardens, while more to the north/northwest, the old town is reachable by walking through Little Italy. Like any large metropolitan area, San Diego offers a wide variety of national and international cuisine. Food representing almost every world cuisine can be found somewhere in the city, and major restaurant chains are found in almost every district. Some of the best districts for fine dining are Downtown, Hillcrest, and La Jolla, which all offer extensive options that cater to both a local and tourist crowd. Pacific Beach also has a bustling, albeit more laid-back, dining scene, while the neighborhoods of Mid-City (particularly Kensington and North Park) have plenty of great restaurants that cater to a more local crowd. Other food scenes of note in San Diego are the concentration of Italian restaurants and delis in Little Italy in Downtown and the numerous Southeast Asian restaurants and markets that serve the large Asian-American population in Kearny Mesa. Bars and clubs can stay open past 2am but are not permitted to sell alcohol after this time. Expect beer bars to be open until midnight and bars and clubs to call last call around 1:30-1:50am. A medium-sized beer generally costs $4-5 in a restaurant. The best bar scenes in San Diego are in the Gaslamp Quarter area of Downtown and in Pacific Beach. San Diego offers a wide range of accommodations and a wide range of price levels. If one doesn't mind splurging, there are a number luxury highrise hotels in Downtown and numerous beachside (and bayside) hotels and lavish resorts along the coast in Coronado, Ocean Beach, Point Loma (along the bayside), Mission Beach/Bay, Pacific Beach, and La Jolla. For travelers with a smaller budget, San Diego also has a few downtown hostels and many chain motels scattered across the city. A high concentration of the chain motels are located along Hotel Circle in Mission Valley. 500 West Hotel, 500 West Broadway, toll-free: +1-866-315-4251, fax: +1 619-234-5272. YMCA-affiliated Hostel in downtown San Diego, right next to Amtrak railway station. Free Wi-Fi. Dorms from $44 per night. Hostel on 3rd, 542 3rd Ave, ☎ +1 619-595-1440, e-mail: hostelon3rd@gmail.com. Hostel with easy access to the historic Gaslamp District. They have 2 bed private rooms, 4 bed mixed, 4 bed female and 6 bed mixed dorms. Most of them with a sink and a closet. Amenities include free wifi, free luggage storage, and free breakfast. Rates start at $25 per person. Hostelling International San Diego-Downtown, 521 Market St, ☎ +1 619-525-1531. Check-in: 2PM. It's in Gaslamp Quarter, clean, friendly, and offers 24-hour desk service, free breakfast, laundry facilities, lockers, and Wi-Fi. This hostel is part of a non-profit organization, HI-USA. The only hostel in this area to offer air conditioned rooms with iPod dock alarm clocks. Also offers free activities including: Walking tours, pub crawls, a screen printing workshop and bicycle tours. In addition there are three donation based dinners offered per week. Rates start at around $25 for dorm rooms and around $65 for private rooms (rates vary). ITH Adventure Hostel, 1658 Front St, ☎ +1 619-228-9234. A friendly and cozy hostel that offers free breakfast and free dinner daily. Also they provide free adventure activities that guests can go on to enjoy San Diego. Dorm beds start around $20. Lucky D's Hostel, 615 8th Ave (cnr 8th and Market Street), ☎ +1 619-595-0000. Fun hostel in San Diego's trendy East Village. The hostel offers free breakfast, free dinners, free internet, free house phone, free pub crawl and free use of linens and towels. They also run a weekly tour to Tijuana. Dorm beds start around $20/night, privates around $50-60/person. La Pensione Hotel, 606 West Date St (at India), ☎ +1 619-236-8000, toll-free: +1-800-232-4683, fax: +1 619-236-8088. In Little Italy, this lovely hotel has 75 small rooms with views of the bustling neighborhood. Parking is quite tight here, but the place is quite affordable at around $80/night. USA Hostels San Diego, 726 5th Ave, ☎ +1 619-232-3100. Small hostel in the Gaslamp Quarter. The hostel offers free breakfasts, wireless access, lockers, a laundry room, and bike rentals. They run a tour to Tijuana on Saturdays. Dorm beds start around $20/night, privates around $50-60/person. Bristol Hotel, 1055 1st Ave, ☎ +1 619-232-6141, fax: +1 619-232-0118. A contemporary and casual hotel, the Bristol features an unusually large pop art collection. $150-$200. Comfort Inn Gaslamp Convention Center, 660 G St, ☎ +1 619-238-4100, fax: +1 619-238-5310. Check-in: 3PM, check-out: Noon. A 100% non-smoking hotel in the Gaslamp Quarter. $119-189. Courtyard by Marriott San Diego Downtown, 530 Broadway, ☎ +1 619-446-3000, fax: +1 619-446-3011. Check-in: 3PM, check-out: Noon. A unique 245-room hotel where timeless charm is blended seamlessly with sophisticated comfort of modern guest accommodations. Ideal location in the Gaslamp Quarter. $169-249. Gaslamp Plaza Suites, 520 E St, ☎ +1 619-232-9500, fax: +1 619-238-9945. Check-in: 4PM, check-out: 11AM. Housed in a beautiful historic building, this hotel offers lovely rooms and complimentary breakfast - served on the rooftop terrace (weathering permitting). $120-275. Horton Grand Hotel, 311 Island Ave, ☎ +1 619-544-1886. A luxurious Victorian-era hotel in the Gaslamp Quarter. $175-300. Marriott Gaslamp Quarter, 6060 K St, ☎ +1 619-696-0234, fax: +1 619-231-8199. 22-floor hotel in the Gaslamp neighborhood with most of the services and features typical of Marriotts (sadly, no pool or jacuzzi). Rooftop bar, on-site restaurant. $200-350. Doubletree San Diego Downtown, 1646 Front St, ☎ +1 619-239-6800. Check-in: 3PM, check-out: noon. Complimentary airport shuttle, extensive amenities and friendly staff. The Keating Hotel, 432 F St, ☎ +1 619-814-5700. Check-in: 2PM. A modern luxury hotel with an on site bar, spa services, and Italian designed rooms. Rates start at around $200 for a Stanza, up to around $1200 for a luxury suite. Hotel Palomar, 1047 5th Ave, ☎ +1 619-515-3000. Formerly the Se Sean Diego, now a Kimpton Hotel. This boutique hotel is near Horton Square and a few blocks from the Gaslamp District. Rates start at $159 a night. Manchester Grand Hyatt, 1 Market Pl, ☎ +1 619-232-1234. This hotel has over 1600 rooms, making it the largest hotel in San Diego. It's next to the Convention Center, and consists of two towers that are connected on the bottom four floors. Prices start around $280 a night. Omni Hotel, 675 L St, ☎ +1 619-231-6664, fax: +1 619-231-8060, e-mail: reservations@omnihotel.com. A modern luxury hotel connected to Petco Park via a skybridge across the street, the Omni was built along the new ballpark and has a few baseball relics inside, such as Joe DiMaggio's cleats in the lobby, Babe Ruth's 1932 contract with the Yankees in the Presidential Suite, and a broken bat autographed by Willie Mays in the fifth-floor hallway. U.S. Grant Hotel, 326 Broadway, ☎ +1 619-232-3121. A luxurious and historic hotel across the street from the Horton Plaza Square. It was built by Ulysses S. Grant's son, who later became a real estate developer in San Diego. $270-500. We have a comprehensive list of accommodation in San Diego searchable right here on Travellerspoint. You can use our map to quickly compare budget, mid-range or top of the range accommodation in San Diego and areas nearby. This is version 51. Last edited at 23:16 on Jan 21, 19 by bigleap.abg. 33 articles link to this page.